Well, *NOW* I am finally ready for Christmas as I load the last day of the 12 Days of Uncanny X-Mas! It’s been a really fun time ringing in the season with mad mutant love. Big, big, big, big holiday ups to my partner in crime on the 12 Days — Matt, the sardonic, sarcastic tsar of www.ComicsCavern.com. The man has a gift for comedy … hell, it’s damn near a mutant power to make people laugh! So, kick back, read and celebrate the season with our favorite representatives of ho-ho-homo superior! Click the image to embiggen! And, if you like it, please share it with friends. 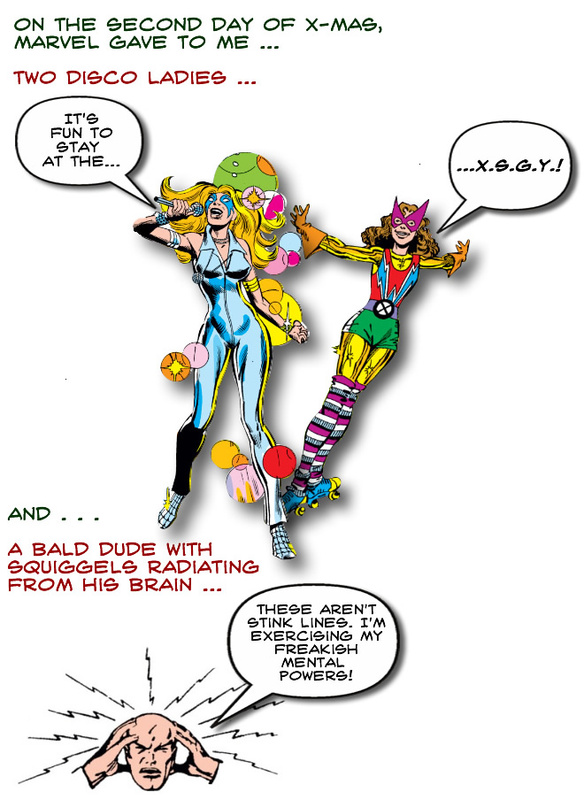 This entry was posted in Comic Book Humor, Comic Books, Marvel Comics and tagged 12 Days of Christmas, Ariel, Bamf, Beak, Beast, Birdbrain, Cable, Captain America, Captain Britain, Christmas, Colossus, Comic Books, Comics, Comics Cavern, Cyclops, Dazzler, Emma Frost, Hank McCoy, Kitty Pryde, Legion of Super Heroes, luke cage, Madrox, Magneto, Marvel, Marvel Comics, Meggan, Mystique, New Mutants, Nightcrawler, Professor X, Psylocke, Shadowcat, She-Hulk, Snikt, Sprite, Storm, Thunderbird, Tim Gunn, Wolverine, X-Factor, X-Mas, X-Men, Xorn. Bookmark the permalink. 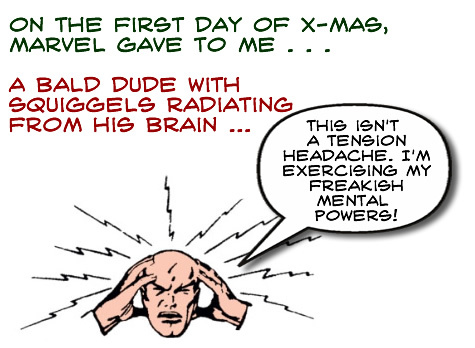 3 Responses to The 12 Days of Uncanny X-Mas ~ Days Twelve! SO AWESOME! I can’t believe how creative you are. So amazing!